Put your Bombonieres into one of these beautiful organza pouches. Ideal for presenting any small gift. 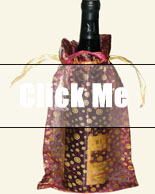 Very popular for wedding favours and return gifts. Buy your own chocolates or sugar almonds and put into these pouches. They come complete with ribbons. 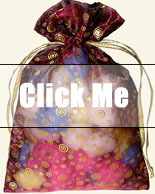 Here is the ideal gift wrapping for your handmade soap, bath salts, jewellery, pot pouri, or sterling silver earrings. They provide a beautiful base to sew on beads, charms or embroidery. From AUD$0.31 per pouch. We welcome enquiry from hotel chains and event organisers wanting to use organza bags to provide welcome gifts. Quality guaranteed - consistent shape, size, colour and stitching, or your money back. Our beautiful, sheer flat organza bags have dual satin drawstring cords for a secure closure. Simple and elegant for candles, potpourri, cosmetics, soaps, sachets, party or wedding favors. They are truly gorgeous for anything you decide to put in them.